I think you are a lot better organized than I am. I like the rolling table. That is a really good idea - much better than piles of parts on shelves all over the shop. If I had to guess, this will be a breeze compared to the Metz but I'll be interested to get your take on it when it is further along. I'm a very visual thinker/worker, if I can't see it then I really struggle hence the need to have the rolling tables (there another one on the other side though its primary function is a welding table). As for being easier than the Metz, that is largely the case. 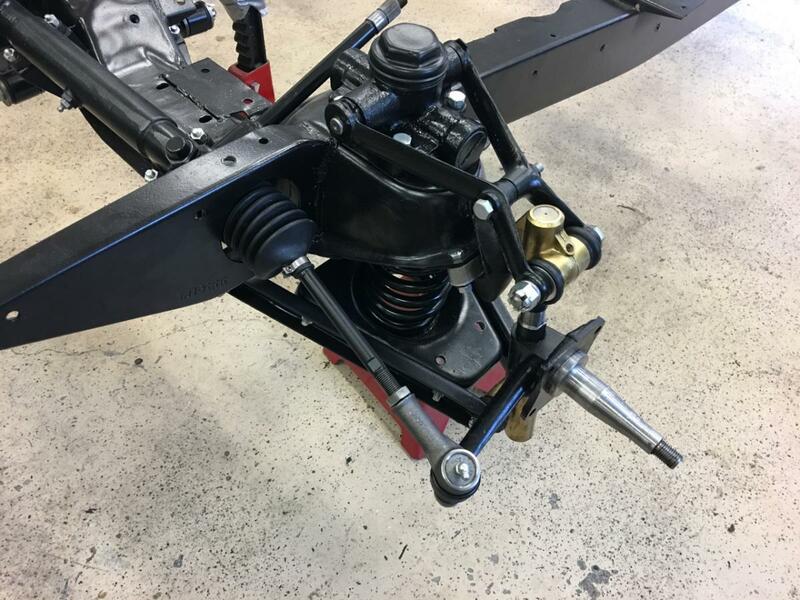 The ability to order parts in the range from used, NOS and multiple reproductions is a huge benefit. There is much more information available as well though more doesn't always mean better. The enthusiasts for the MG TD and a brass era car like the Metz are a bit different. The technical knowledge available for a brass era car tends to be much deeper while the MG TD tends to swing towards upgrading the cam, adding horsepower, etc. I have found that having the ability to make parts coupled with being able to buy parts on the Internet provides one with wonderful options. Though while I can buy most everything I'm still making parts. 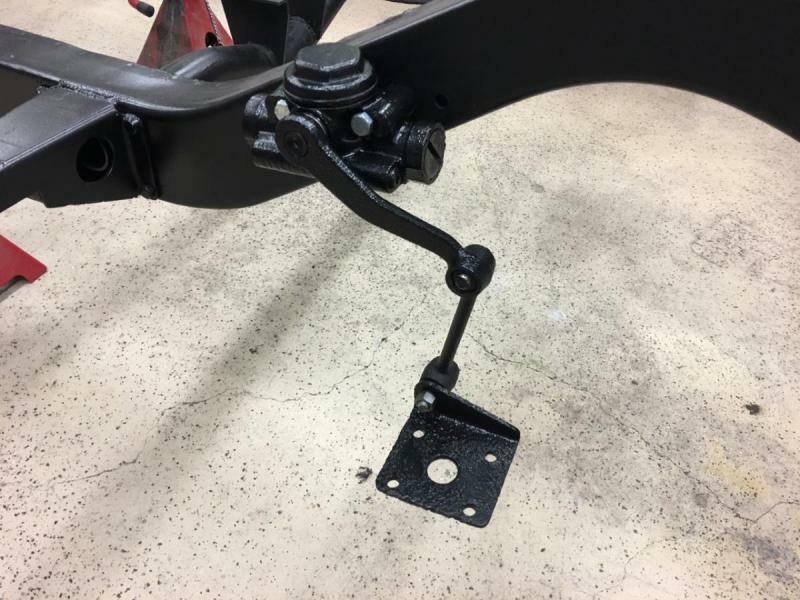 The odd custom bolt, bracket, etc. 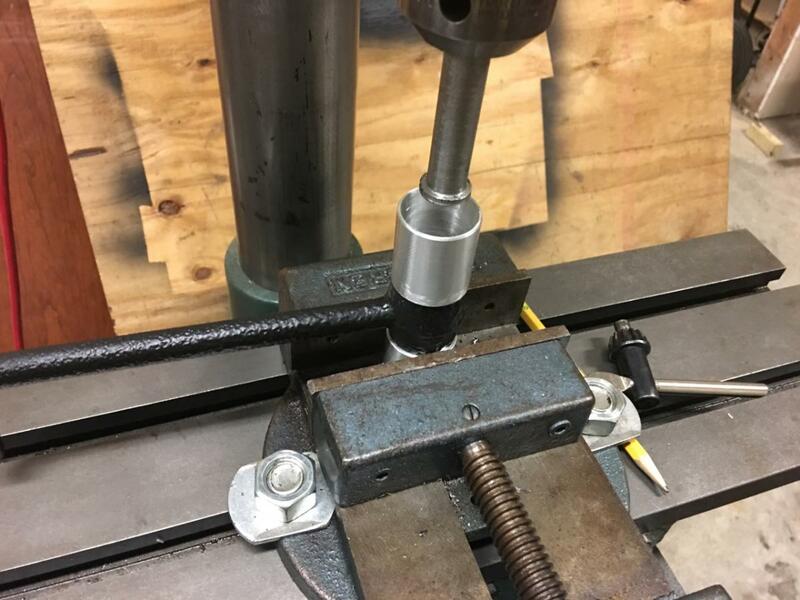 There have been a few custom bolt-like parts that were very expensive to purchase (more than $50) that I was able to easily make with the lathe. The dampers (shocks) often leak because the bore for the shaft and the outer bore for the oil seal are not always concentric. That was trivial to fix with the horizontal mill. All that said, I do miss the Metz and can't wait to get back to it. 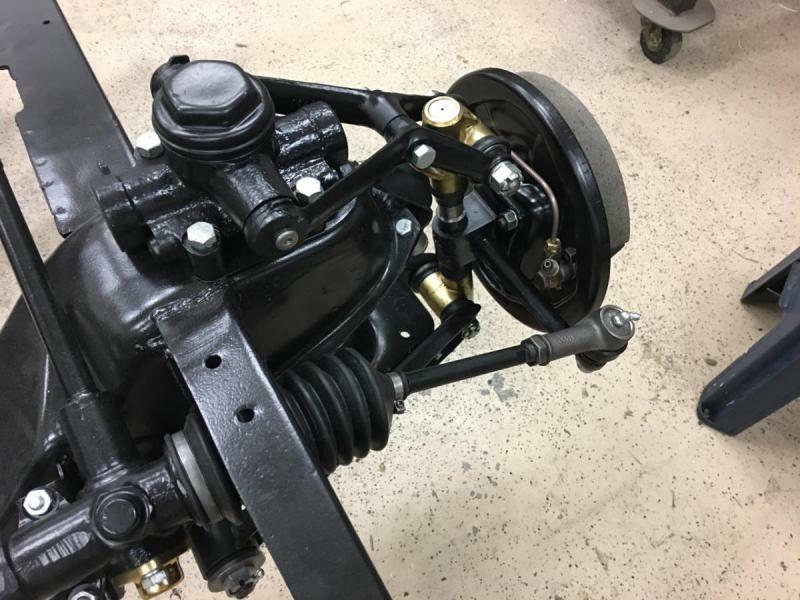 Those parts look familiar... You are progressing quite quickly, great work. Love your shop layout, it makes it so much easier with the space. My shop only works for contortionists. Can't wait to see it come together and still interested in the Metz, when you get back to it, too. Moving along a little... 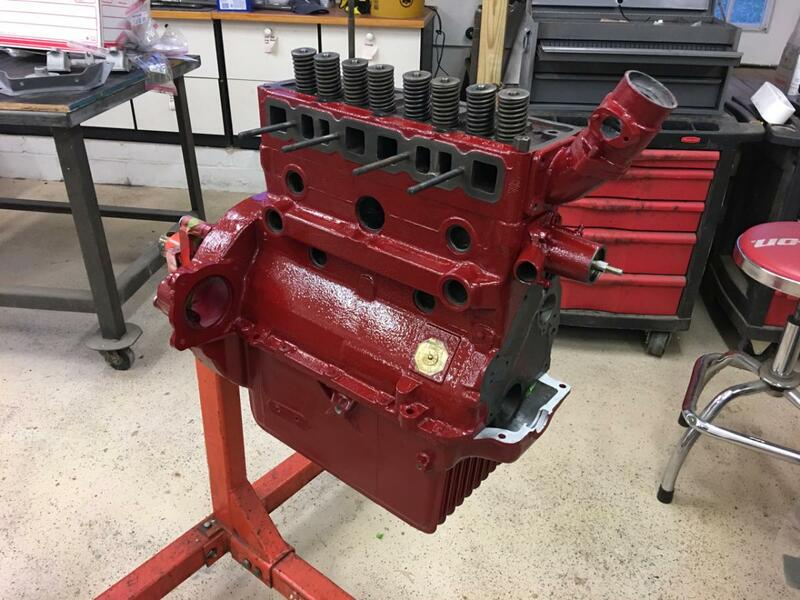 Painted the engine. There's nothing in the engine, just bolted a couple of pieces on to paint them. While it takes a good bit more time I like to paint the pieces and then put the engine together rather than painting the engine after assembly. I really prefer the contrast of paint and natural hardware. That progress is stalled because, of course, I ran out of paint. 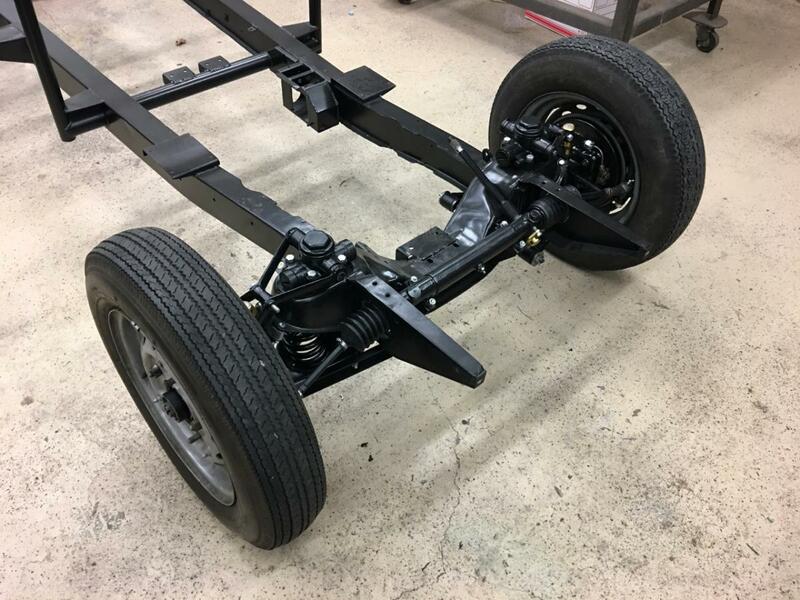 Progress on the chassis parts has stalled as well. 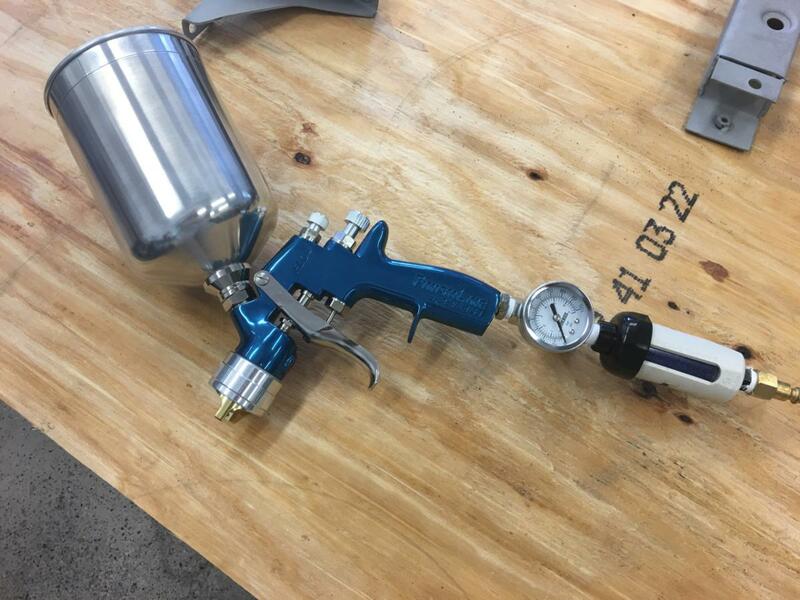 I ordered a new paint gun (DeVillbiss Finishline 4) and, of course, it got lost. I did finally get it but, of course, it is raining and will be for the next 8 days. Hopefully there will be a break or two this weekend and I can get the parts painted. In addition I managed to not order all the parts I needed and will now wait on those to come in. I've really struggled to have what I need when I need it. It really is amazing how I can get a sub-project going, get stalled by some missing item or problem, start another sub-project, get stalled, repeat, repeat. Eventually I get to the point I just have to wait on UPS. Thanks goodness shipping is so fast these days. While it takes a good bit more time I like to paint the pieces and then put the engine together rather than painting the engine after assembly. I really prefer the contrast of paint and natural hardware. Luv2, I agree with the contrast of the paint and natural hardware. To me that's what adds interest to an engine or a car. But you are right, it does take a lot more time, plus I always have to touch up the fasteners after bolting the engine together. I've done it both ways. Not sure which way I prefer..............it's usually a decision based on the car itself and how much detailing there is on the rest of the car. Great progress on this MG TD, keep the reports coming! Pieces ready to paint and new spray gun finally arrived. Finishline 4 FLG-670 with 1.3, 1.5 and 1.8 tips. Really great gun, atomization is fantastic and controls are easy to work. I added an in-line desiccant water filter (blue when its good and gets pink when saturated) and used the air regulator that came with it. 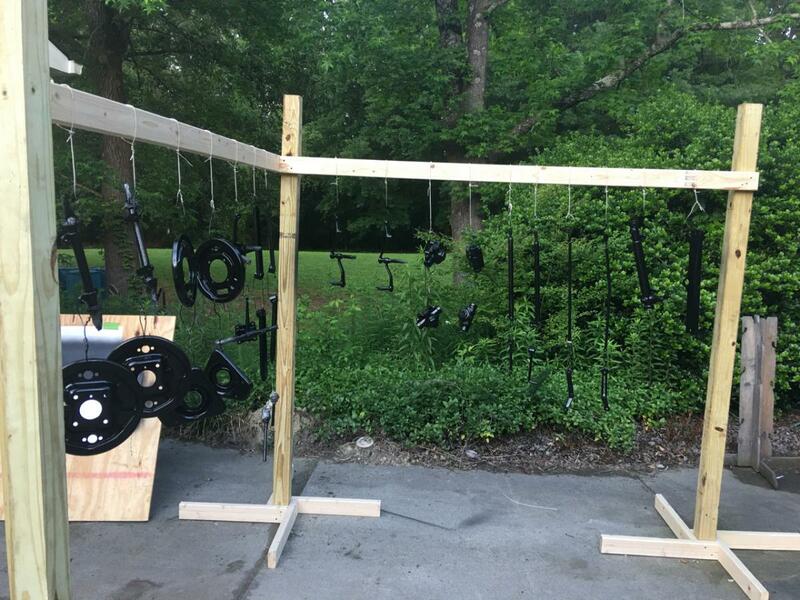 I built a hanger system to hang the parts from and while I thought it was big enough it barely held half of the parts. I should be able to do the remainder today. Whoa! Nice gun and nice hanger system! You are right, when parts are ready to paint it's difficult to hang them safely. I had my system when I restored my cars, it was much crude as yours! Well done. That certainly looks familiar. 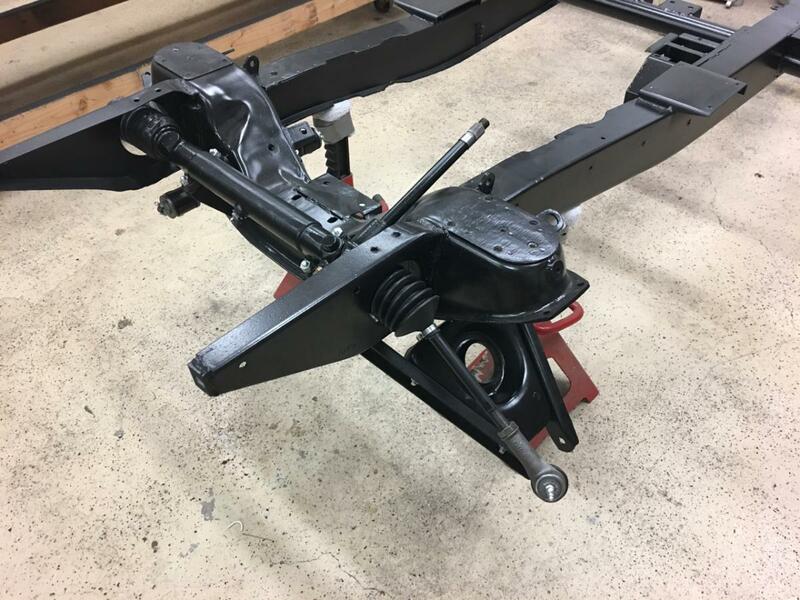 I think of it as the hanging fruit stage, when the chassis components are cleaned, restored and painted. Fruit of your labours, perhaps. And now comes the fun part of the restoration. Bolting all of those clean, shining pieces back together. Enjoy! Painting is finally done though, of course, a couple of pieces hid from me and didn't get painted. I'm sure another part or two will show up as we start assembly so I'm going to hold off for a bit and hope to paint the remaining items at once. My daughter is back from college and that's been a big help. We've been setting up a plating system and doing some test plating to get things the way we want them. Most nuts/bolts/etc on the MG TD were cadmium plated. That's not really an option for us in the shop but Caswell has a nice "copy cad" system that we've been able to get some good results with. 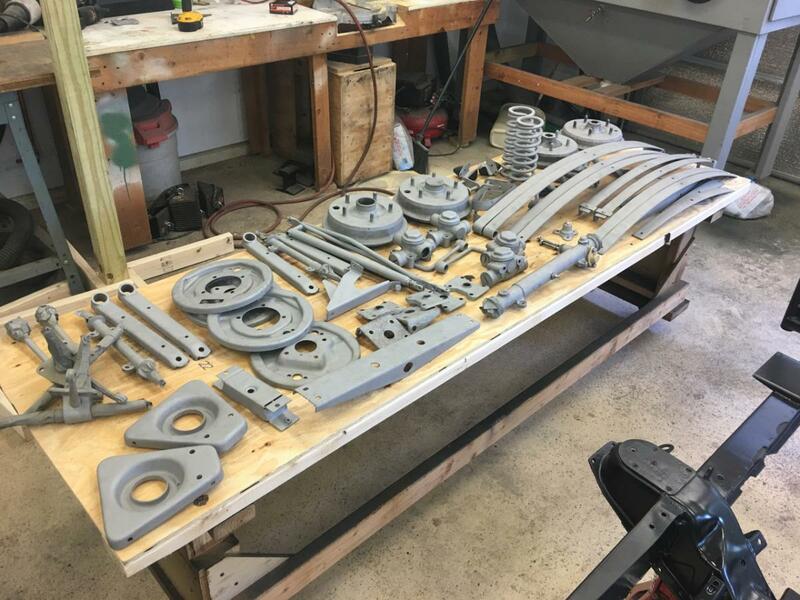 The magnitude of the work is a little overwhelming as every nut, bolt and washer is to be cleaned, blasted, prepped and plated. (on edit...) Actually, some of nuts/bolts are fine and if we can get the plating to match then we don't need to plate everything. I don't want a mismatch so we'll just have to see how they come out. Caswell has a black, blue and yellow chromate solutions that you can use after the copy cad plating (zinc plating) and that give a nice black, "blue metal" and yellow cad look. I'll post some picture of the bolts we've plated next. Plating the nuts/washers/bolts has proved more difficult than imagined... it is hard to get consistent results. I think we've got a workable process right now but it has certainly eaten up a lot of time. We're hoping to get some assembly work done this weekend. Depressingly little progress this weekend. It is hard to find the time and when we do it seems we're missing things. Went to a British car show Sunday and that was pretty neat as we really haven't seen an MG TD that is complete and drivable. I think we'll make better progress this week and next weekend. A lot of things needed to get "set up" and we got a few of those done. Still waiting on parts and tools as well. The shocks need to be reamed a bit to fit the oil seals so I'm waiting on a 30mm reamer. Need some 1.125" dish style core plugs and, apparently, those only come from England so we're waiting on those as well. I feel like we should be zipping this thing together and it is just barely moving. We've been having a good time so that's nice. Jeff, I often go to BringaTrailer.com for pics of cars for sale and sold to be used as reference. Actually, there is one TD for sale and many that have been sold. All have lots of pics, some of which might be useful or interesting. The 30mm reamer came today and I was able to get the dampers (shocks) reamed out so I could fit a standard oil seal. 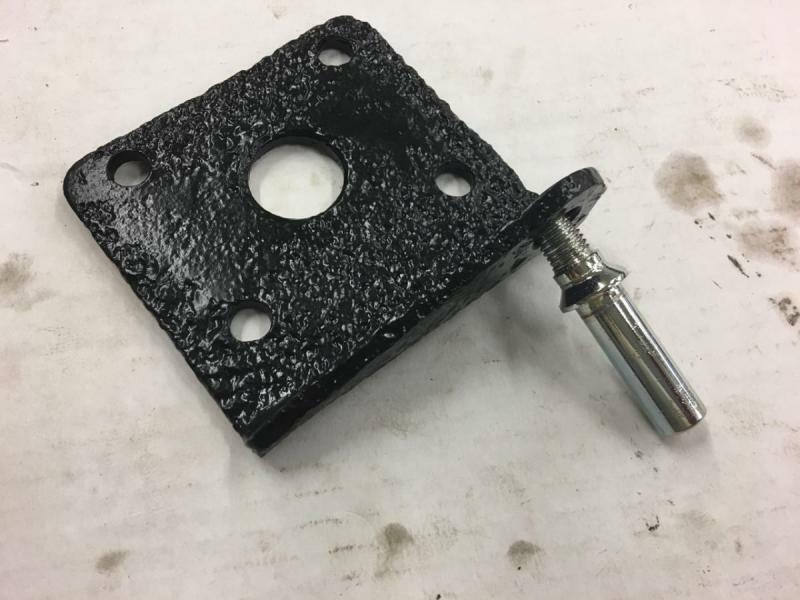 The Girling dampers have two issues, first the openings on each side are not a precise size and second, that opening isn't always concentric with the inner bore which makes the oil seal less effective. 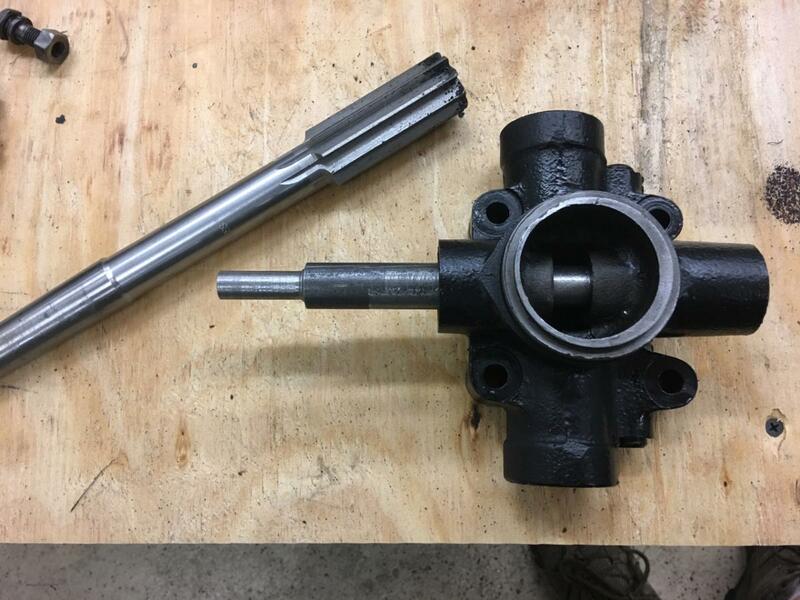 I was able to solve both problems with the reamer. 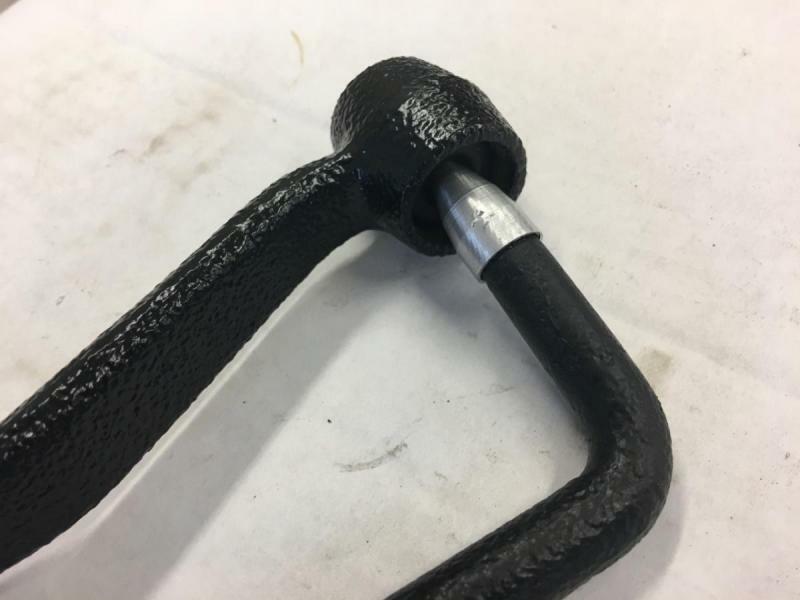 I made a guide bar that was stepped with ODs of 17mm and 19mm as well as 1/2" at the end. The guide bar fits snugly in the damper and lets me lock it down aligned with the inner bore. I then removed the bar (and chuck) and inserted the MT3 30mm reamer. All that was left then was to ream it out as the damper was locked in position. I imagine the company that rebuilds these probably has a reamer with a 17mm and 19mm pilot simplify the process. Shocks are back together and assembly can now begin. 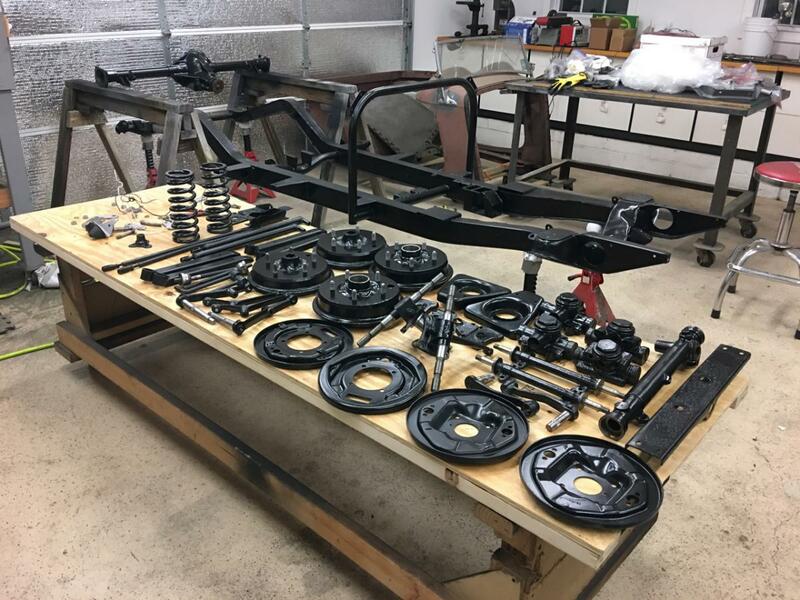 Starting to make some progress and I *think* I have all the parts I need to get a rolling chassis. I have, however, thought that many times. Got the front backing plates put together, brakes and hubs assembled and on the car. Put the wheels on for a bit just so I could see it on the ground. Things are starting to come together. I think I have everything for the rear and to finish the brakes. Would be great to roll it out of the shop (and stop it). That's looking really good Jeff. Many years ago I reassembled a dismantled TC and I assure you it didn't look that good when I was done. We weren't thinking much about "restoration" in those days, at least not to the point of replating the bolts! Thanks Joe, this has certainly turned into a bit of an art project as well. There's something fascinating about the old bolts with all their unique stampings after they've been cleaned and plated. We're both hooked on it and all sorts of things around the shop are liable to get plated pretty soon!! I had to make some tools to get the rubber shock bushing pressed home. 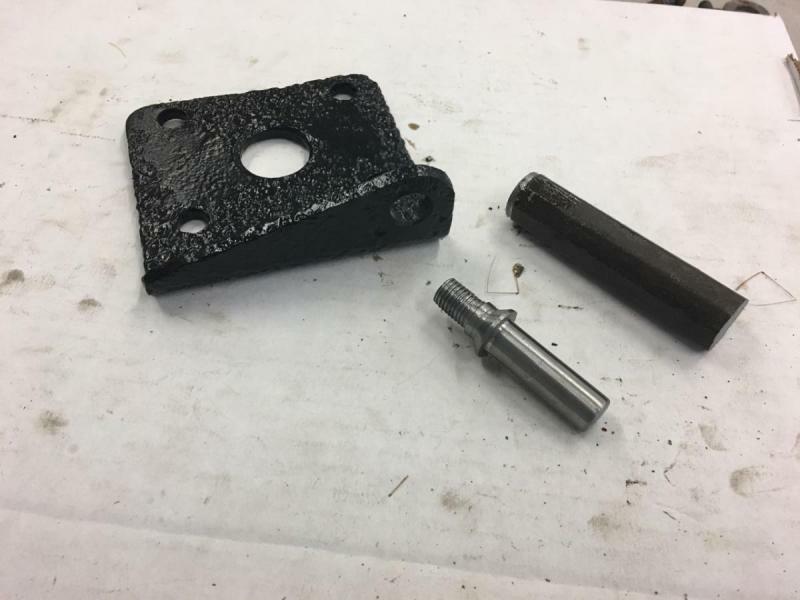 The OD of the bushing is 1.020" and the ID of the shock is 0.745" Moss Motors sells a tool kit (3 pieces) for $75 or so but I though this would be a great time to get some work in on the lathe. 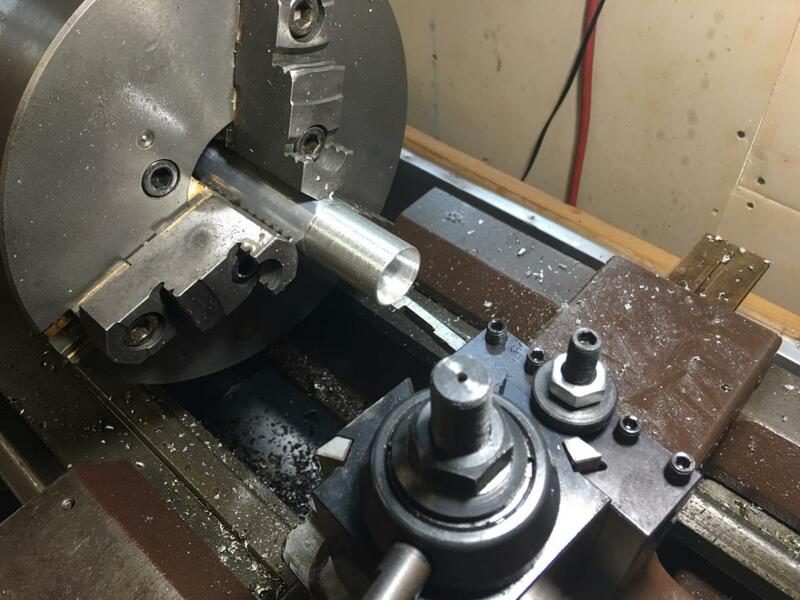 I bought 1.25" aluminum bar stock (2011) as I figured it would be very easy to machine and plenty sturdy enough to press in the 4 bushings. I bored a 0.700" hole and then modified an inside thread tool to get the taper as I didn't have a boring bar. Since it was aluminum it wasn't a problem and was easy to do. The "funnel" has an ID of 1.100" at the big end and .700" and the small end. There is a step at the small end so that it will plug into the shock link. 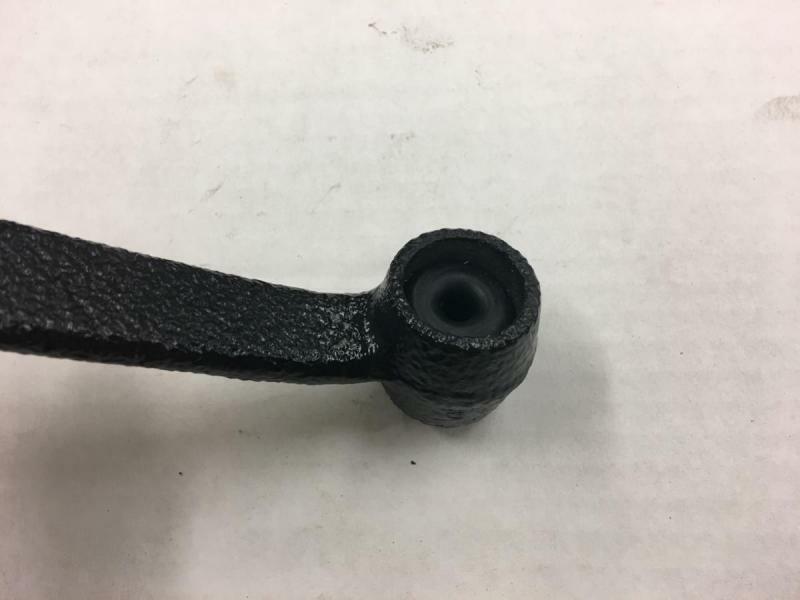 I made another piece that holds the shock link in place and also limits the depth the bushing gets pressed in. I still have to make a "guide pin" to get the other end of the shock link into the hole but that'll be another day. It took way too long to do this and would have been much more time effective to buy the tool set from Moss but it was a great chance to improve my skills on the lathe. Good thinking... unless you get into the habit of doing these things, that will always be the case. As you do it more, it takes less time and, more to the point, you will certainly come against a great many more things where there simply isn't a tool available or it's really expensive. I figure I spend just as much time making tools as I do using them but even I'm surprised when a tool I made for another job is just right for the one I'm currently working on. It happens more often than you'd guess. More lathe work today. 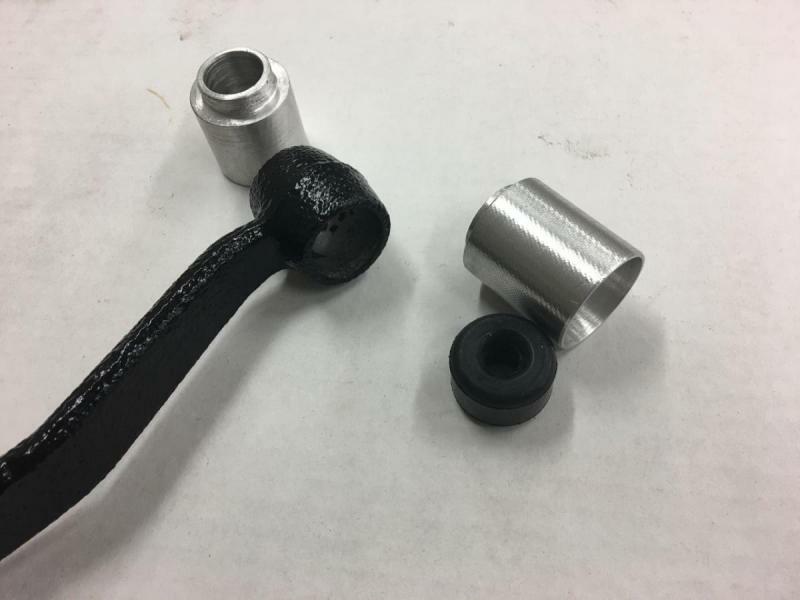 I finished off the third piece of the bushing tool set by making the guide pin. 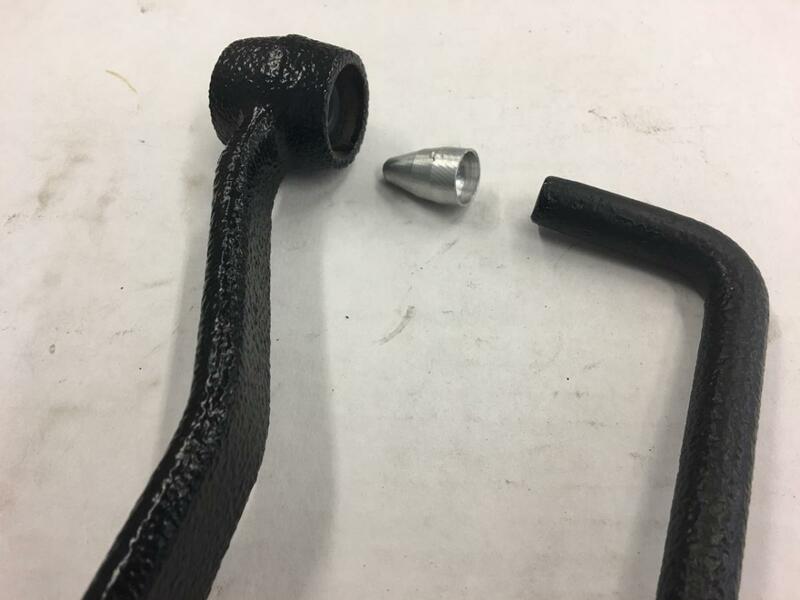 The guide pin fits around the end of the link and is tapered to ease pushing the link into the bushing. 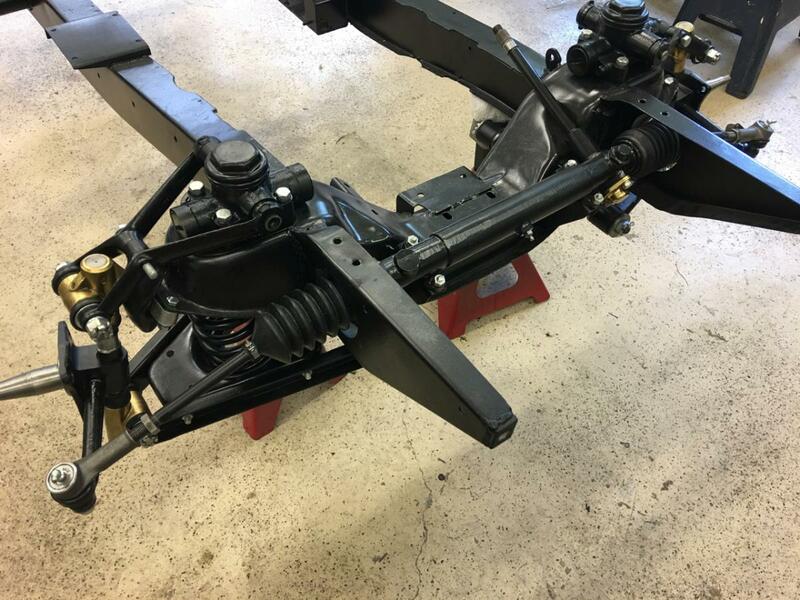 The other end of the shock link connects to a plate that is under the leaf spring. The link attaches via a special bolt. You can see a similar bolt in the third picture from an MGA link. The bolts are $30+ each so, again, I decided it would be worthwhile to make them. 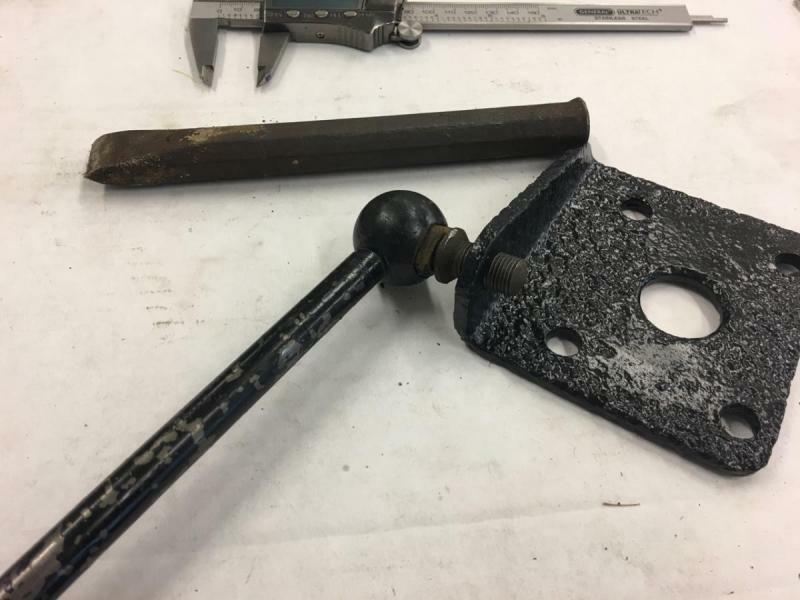 I started with an old chisel as I was able to determine this was made of high quality tool steel. I couldn't figure out how to turn the taper so I ended up grinding a tool with the desired angle. This worked really well and I think it was probably the right way to do it. My threading skills are still a little weak and since I can't turn the BSF pitch anyway... I used a 7/16"-18 die that I ordered back when I started the project. After I finished both parts and verified the fit I cleaned them up and plated them. They ended up a little too shiny since they had a smooth finish from the lathe and not the media blasted finish. I don't think it is a problem as it shouldn't be too noticeable. It is the right way to do it... the alternatives are more complicated and not as satisfactory. 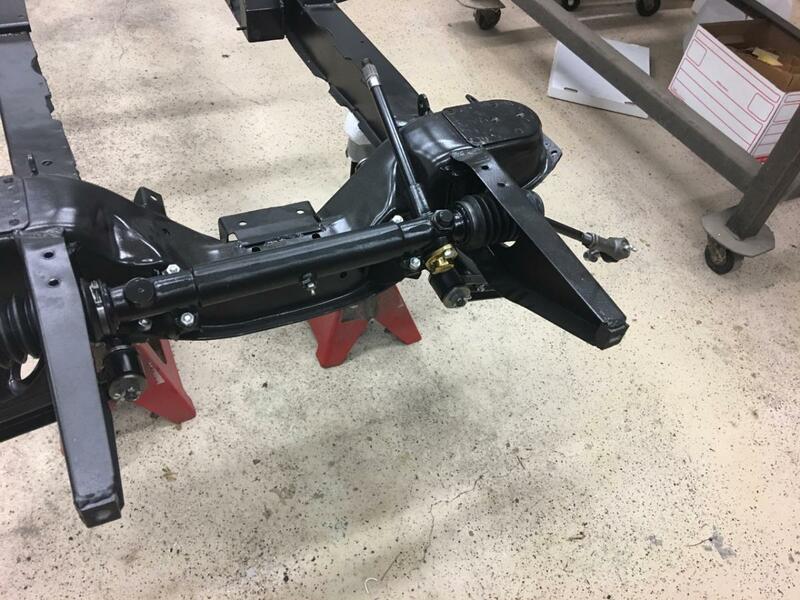 Assembled the rear backing plates, they are ready to be bolted to the rear axel. Assembled the rear shocks. These had been reamed and also need a "dish style" core plug to replace the ones I removed to press out the arm. I could only find the dish style core plugs in England and fortunately the company there (Core Plugs International) were just fine sending 4 little plugs all the way across the pond. I think the total including shipping was less than $15. 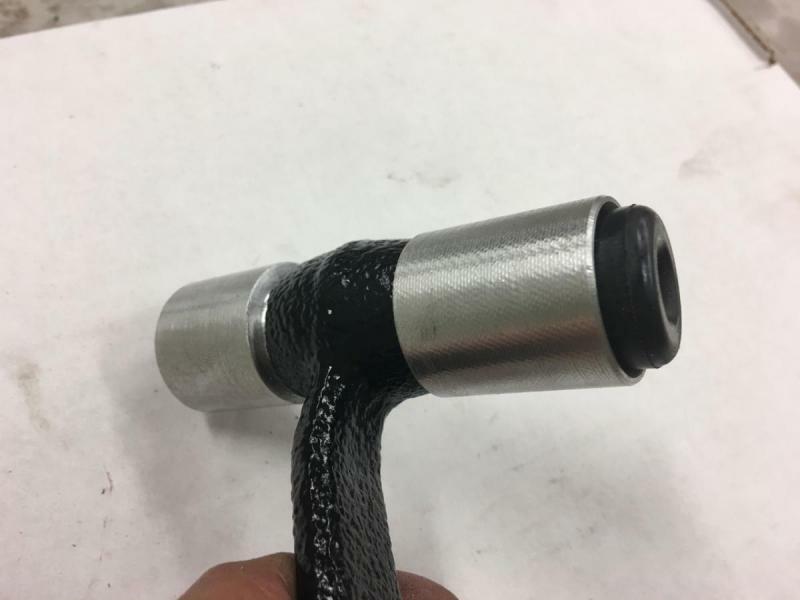 The Internet is a great tool no doubt... but you still need a company that is willing to take 4 little 1.125" core plugs, put them in a little pouch, fill out the customs paper work and send it to the US for less than $15. Used the tools and bolts I created yesterday to assemble the links and attached them to the shocks. Hung the shocks from the frame. 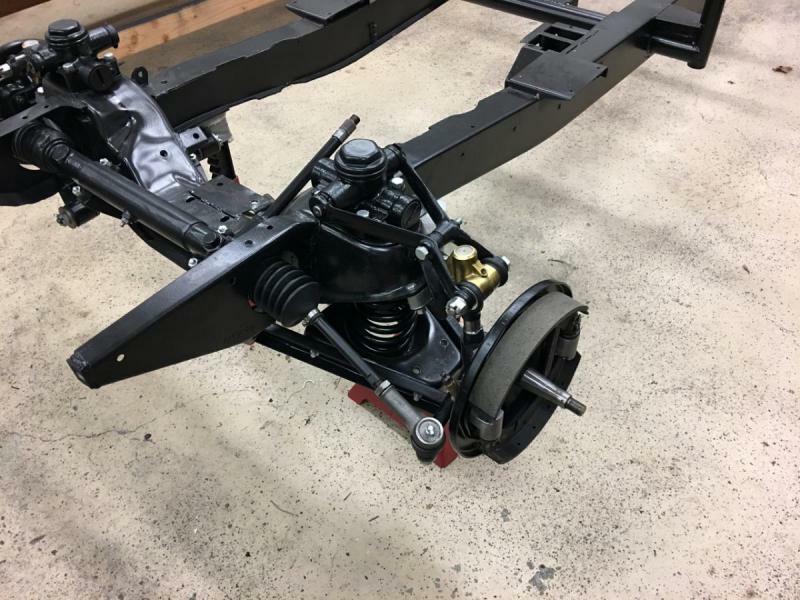 I really wanted to get the leaf springs hung and the axle attached but time slipped away from me. While putting the backing plates together I made several trips out to the parts car either to see how something was attached or to steal a part or two. While it seems obvious, I don't think I realized just how important a good parts car is. I've gotten a LOT of stuff off that car to restore a car that was "all there". Probably more true for a basket case project, but one shouldn't underestimate the value of a good parts car.